With the ClassiPress Sorted Ads Plugin, users can sort ads on category listing and search result pages with various preferences. 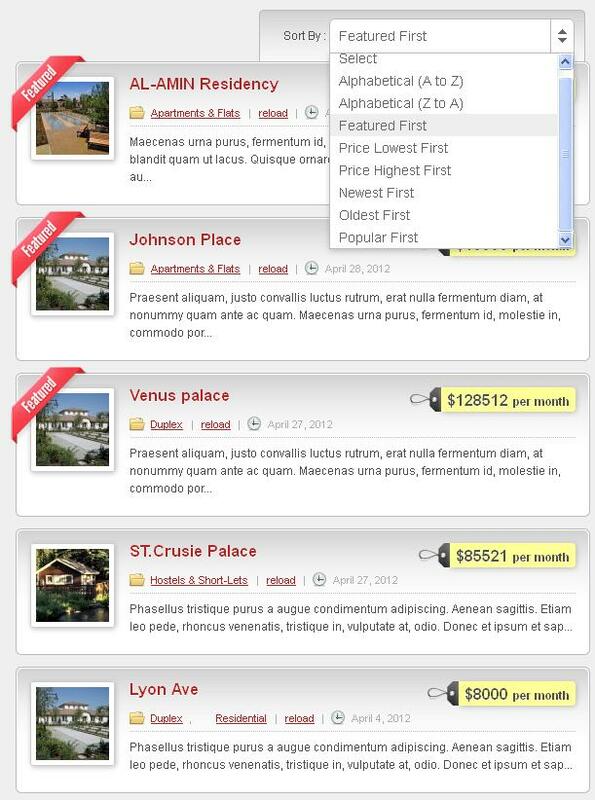 The plugin comes with a set of default sort alternatives for ads listing pages as well as search result pages. Admin can Turn On / Off dropdown sort option. Admin can amendment dropdown option label. Admin can set sort dropdown option display order. Admin can set a default sort option in first time visit. Admin can disable dropdown and set default sort option for ads listing pages as well as search result pages. Open ClassiPress –> Ads Sorting Option page to setup the plugin. I use sorting by price and i see first featured listing. Maybe update plugin and fix that nad give more options about sorting. thank you for this pluggin. working ok but missing from “all ads” page. at that price it needs to be integrated on all listing pages. 100% a must, works great – I just wish it could be in the front page also. I give it 4 stars because there is always room for improvement – in this case I would like the ‘sort ads option’ to appear in the homepage of the website also, right now only appears on search results. Really good plug in, easy to customise the css as well. Thumbs Up. This is exactly what I needed. works great – just what i needed! Works 100%, 3 min to enable it ! Works as a Charm !!! Easy to setup, easy to translate..
is it only one digit currency symbol? I need to use 3 digits, can you help? is this plugin compatible with Flatron Child theme for Classipress?? I didn’t tested it with Flatron child theme but i think it should work with it let me know if you have face any issue with it. Please PM me your wp-admin access with url where you installed Flatron i will test my plugin with it. can not install into my classipress 3.4 version theme? You mean you can’t install plugin ? Please can you PM your site url and wp-admin access ? You have installed plugin successfully you can see dropdown “Sort By : Price lowest First” on category list check below link. yes i installed the plugin successfully 🙂 i want to make a plugin for my website can you do it i will pay for it if you interested i can send you the plugin details. Is it possible for this plugin to sort by Custom Fields? No it will not work for sort by Custom Fields. Do you feel it is possible to edit the code to allow to sort by custom fields? Yes it’s possible and it’s my to do list i have plan to release this type of plugin in future. Thanks for the info. If it is possible, then I’ll purchase the plugin and make my own modifications. 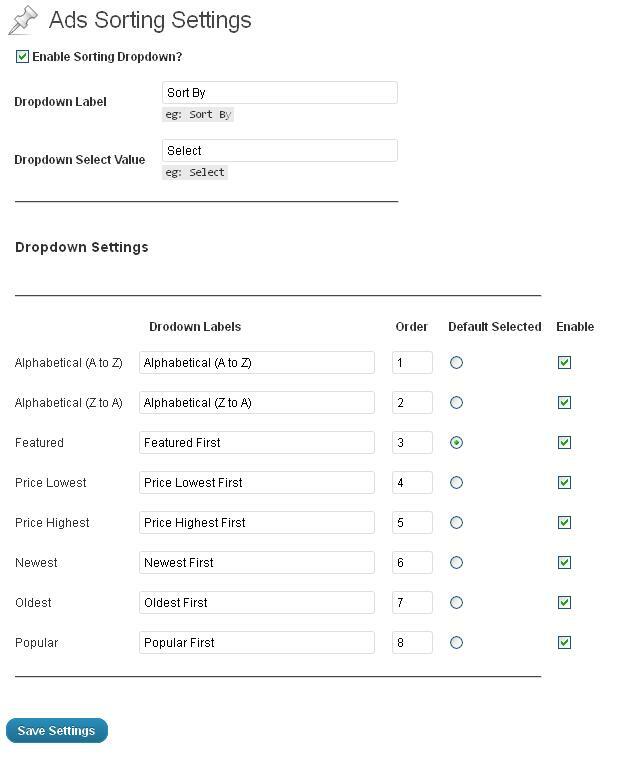 Hi, I just purchased this ClassiPress sorted ads and drop down box for sorting is working based on category selected but my main objective is for Mobile users. is it responsive? After updated, i viewed from Mobile but it still the same. Yes it’s responsive it will fit on specific resolution. 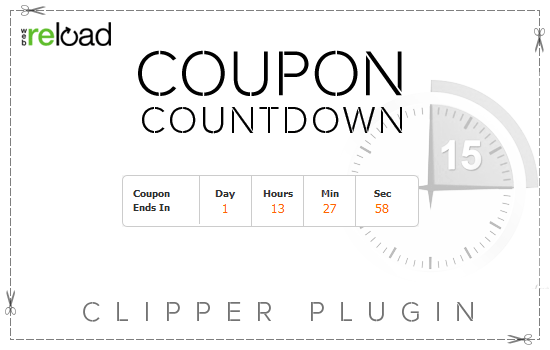 Before purchasing, I would like to know if it was tested and/or works with the Flatpress child theme? Also, I was wondering if there was any follow-up about the custom fields sorting, because this definitely is a core feature that I would need for good implementation. I am not tested it with Flatpress child theme i think it should work with it let me know if you have any issue with that. There is no any custom fields sorting functionality in this plugin. Is this plugin work with simply responsive child theme. I brought this plugin but not working for me in the network site. The Dropdown Settings only visible at Main site. Not showing other network sites. kindly help. Please PM me your wp-admin access with url i will look into this for you. where can i find the file to translate with poedit the pluginn??? Please download latest version of plugin use it you can find file in language folder. Does it work on classipress 4.0? Does it work on classipress 4.0+?